MEG, Mechanical Equipment Group, was established as an identity to bring together our specialised companies; Chain & Drives, Inquip, Techquip, Parts Book, Tank Enviro Systems and Automation & Control, and provide our clients with the complete solution for mechanical equipment & engineering services. Our goal is to provide Design > Supply > Installation > Maintenance across a large range of industry sectors utilising Bulk Materials Handling and Power Transmission. With the advantage of six companies, MEG now provides a larger range of quality & great value products, technical 3D-design, advice, installation & maintenance services; both on our premises or onsite within Western Australia and New South Wales; to our ever growing customer base. To assist our customers, we also offer fast delivery from our distribution partners located throughout major centres in Australia. Our culture defines who we are, it sets forth aims and principles of a united group. Our success is based on the shared values and commitment of the people who are building our company for the future, on developing new technology, on discovering creative & innovative ways to do things, on improving the value of our services to our customers, on building strong relationships with our customers, and on seeking excellence in everything we do. Click Here to view our MEG Corporate Profile. Chain & Drives was established to become the leader in Power Transmission. To complement our range of products, we offer initial concept design of your project and specialised requirements, by utilising our 3D drafting and modelling systems. Our team will manage your project in all stages through design, supply, installation, commissioning and maintenance. We only represent leading quality power transmission products including Hitachi; GB Power Transmission; Lawrence Clutches; Sumitomo; Centa; Pix Belts & Transtecno. Inquip is the distributor for the WAMGROUP of companies range of bulk materials handling, processing and monitoring equipment, Oli Vibrators product range & Kinder bulk material handling product range. Cement Production & Batching Plants; Mining & Processing Plants; Municipal Waste Plants; Waste Water Treatment Plants; Quarrying; Crushing & Screening Plants; Lime Dosing & Flocculent Plants; Silo Storage & Powder / Granule Metering; Bag Loading & Unloading Plants; Horticultural & Agricultural Facilities; Grain & Fodder Processing Plants. Utilising new design methods & products, Inquip has developed a very competitive product range, Modquip. Including Modular Conveyor Systems and Roller Guards. Products are assembled from locally stocked components for immediate delivery and are manufactured and assembled using basic tools - no welding or special equipment is required. We offer full assembly and site installation including commissioning when required. Techquip a leading supplier of technical engineering services for Power Transmission and Bulk Materials Handling. 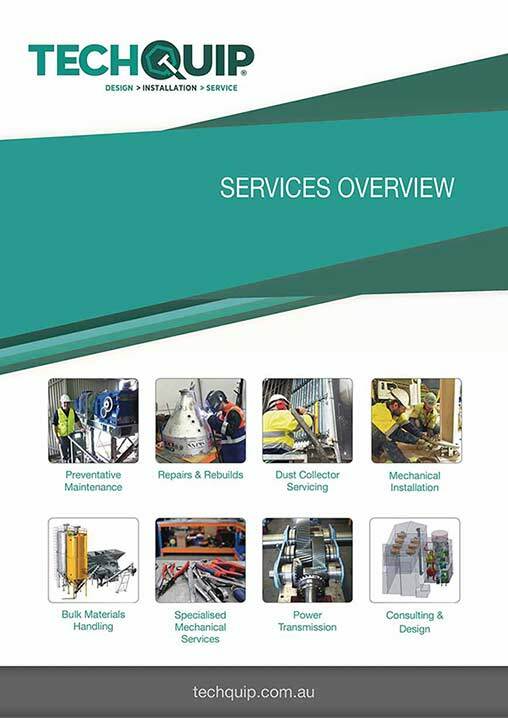 Including design, installation, maintenance and mechanical services. Techquip is the technical services provider division in our group of companies which include Chain & Drives a leader in power transmission and Inquip a specialist in bulk materials handling. Tank Enviro Systems was established in Australia as the exclusive distributor of Brentwood USA – Polychem Systems and associated products. Our head office and warehouse location are based on the Central Coast of NSW to provide distribution centrally for the East and South coasts of Australia. In order to expand our services to the West coast, we have recently opened an office in Perth to service local utilities and industry. Automation & Control are a leading supplier of robotics, automated systems and process control solutions. Our team combine our mechanical and electrical engineering knowledge with our market leading range of products. This provides our partners with economically reliable automated systems that maximise production and reduce costs.